Petitioning includes the right of individuals directly to request the sovereign or parliament to redress grievances, heed protests, receive advice and consider relevant information, thereby circumventing intermediaries. Thus in the period 1833-1914, although most South African petitions were addressed to the local authorities, some were sent directly to the House of Commons in London, as the ultimate effective apex of the imperial governmental system. Most petitions were concerned with personal grievances against the government, while others were concerned with political advocacy in the form of protest or advice, including substantial supporting information. Only three political issues attracted wider action within the settler society, amounting to concerted campaigns. These were the introduction of representative government in the Cape of Good Hope; opposition to the settlement of transported criminals from the United Kingdom; and support for the maintenance of the established status of the Church of England. From the 1880s, petitions by indigenous Africans raised protests at political developments that affected them negatively, notably political exclusion from parliament. However, the scale of South African petitioning was small and essentially marginal to political discourse in London. Keywords: South Africa; British Empire; petitions; parliament; constitutional change; church governance. Petisionering sluit die reg in van die indiwidu om op direkte wyse die heerser of parlement te versoek om griewe aan te spreek en reg te stel, om op proteste ag te slaan, en om advies te ontvang en relevante inligting in ag te neem. Só word daar rondom die tussenpersoon of bemiddelaar gewerk. Alhoewel die meeste Suid-Afrikaanse petisies in die tydperk 1833-1914 aan die plaaslike owerhede geadresseer is, is sommige petisies wel direk na die House of Commons in Londen, effektief die toppunt van die imperiale regeringstelsel, gestuur. Die meeste petisies het te make gehad met persoonlike griewe teen die regering, terwyl ander petisies politieke aanbevelings gemaak het in die vorm van protes of advies, volledig met substantiewe inligting wat dit onderskraag het. Slegs drie politieke kwessies het tot 'n breër optrede, in die vorm van doelgerigte veldtogte, in die setlaar samelewing gelei. Dit was, onderskeidelik, die begin van verteenwoordigende regering in die Kaap van Goeie Hoop, teenstand teen die hervestiging van kriminele uit die Verenigde Koninkryk, en ondersteuning vir die handhawing van die gevestigde status van die Church of England. Petisies van Afrikane het sedert die 1880's protes aangeteken teen kwessies wat hulle negatief beïnvloed het, mees vernaamlik hul politieke uitsluiting uit die parlement. Die omvang van Suid-Afrikaanse petisionering was egter klein en marginaal tot die politieke diskoers in Londen. Sleutelwoorde: Suid-Afrika; Britse Ryk; petisies; parlement; konstitusionele verandering; kerkbestuur. Expressions of loyalty to the Crown also helped to counter white settler prejudices and exclusivity.9 The resultant dual identity of South African nationals, themselves of diverse origins, and their parallel status as British subjects was described perceptively by the minister of the interior, Dr D.F. Malan, in 1927 as: "every South African national is, and must be, a British subject. South African nationality is merely a smaller circle within a larger one".10 The functioning of the British Empire has been represented as a series of networks, webs and circuits linking the various parts, peoples and institutions together.11 Within this network "the centrality of London" as the focus of power, patronage, finance and communication was a vital link.12 In this paper it is proposed to examine one of the strands in this web of empire, linking one peripheral society to the centre. This was composed of the flow of information contained in the series of petitions from South Africa to the House of Commons in Westminster, between the reform of parliament in the 1830s and the First World War. The article begins with an overview of the petitioning process and the place of colonial petitions within the overall scheme of the House of Commons. There follows a chronological review of the petitions received from South Africa, marking the changes in the concerns raised. A conclusion seeks to draw the threads together. It is significant that parliament received petitions from the peripheral parts of the king's dominions, then including Scotland, Ireland and Gascony. Nevertheless, petitions were received and dealt with by the local authorities with appeals to the king as a last recourse.16 Petitioning was incorporated into the laws and usages of the colonies and states which evolved as a result of English and British colonial activity. Thus the American Continental Congress petitioned the king for redress in the period before the declaration of independence.17Similarly, the West Indian parliaments and colonists' interest groups sent petitions to parliament favouring the retention of slavery in the late eighteenth and early nineteenth centuries.18 However, most petitions concerning the colonies originated in the United Kingdom, notably during the controversies surrounding the abolition of the slave trade and slavery.19 Thus between 1824 and 1833 some 20 000 petitions were received in favour of the abolition of slavery in the colonies.20 In 1833 alone a total of 5 020 petitions with 1.3 million signatures originated within the United Kingdom, calling for the abolition of slavery.21 Although the right was clearly stated, colonial subjects exercised this approach comparatively rarely with regard to the distant imperial parliament in London because most grievances involved the local administration and therefore might be more readily dealt with locally. An approach to the authorities in London was essentially a last resort when all other avenues of redress had been exhausted and the petitioners considered a final appeal to those perceived to possess the power to overcome local obstacles. 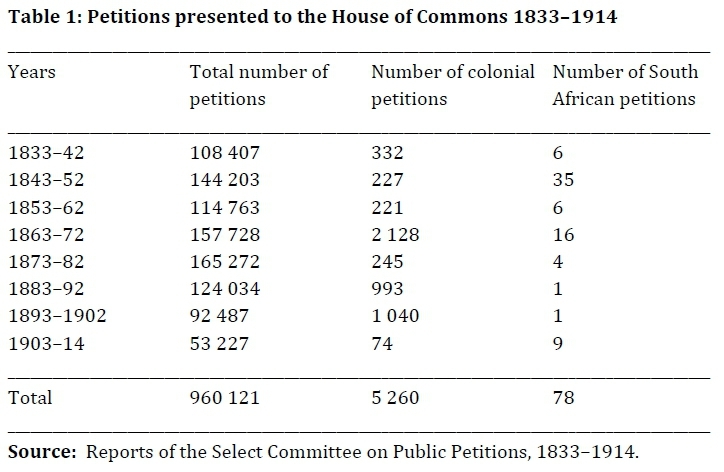 Only 0.5% of petitions in the period covered originated in the colonies and of these only 1.5% originated in South Africa, compared with 4.2% in Australia and New Zealand, 5.6% in Canada and 84.2% in India.31 The educated Indian elite found petitioning a direct and effective means of raising grievances and promoting political programmes and protests in a peaceful manner. In addition, petitions offered the government a valuable source of information on the state of Indian society, the problems it encountered and the deficiencies of the colonial responses.32Furthermore, in societies with low levels of literacy, before the introduction of universal education in the late nineteenth and twentieth centuries, scribes, clerks, lawyers and letter-writers were available to record, translate and attest for people unable to do so themselves. Thus petitioning was open to literate and illiterate alike, whether in thirteenth century England or nineteenth and twentieth-century South Africa and India. Thus the scale of colonial petitioning also reflected the size of the population, which in 1911 had reached 315.2 million in India compared with only 6.0 million in South Africa.33 In making these identifications there is some ambiguity as the number of petitions concerning colonial affairs was far higher. There were petitions from businessmen with interests in various colonies, retired colonial civil, naval and army officers as well as lawyers representing colonial interests, who were resident in the United Kingdom and have been excluded from the calculations.34 On occasion residents of the colonies petitioned parliament while they were visiting England, and these petitions, where they are clearly identifiable, have been included in the colonial totals. That your honourable House, in the Session of the year 1819, acceded to a grant of £50,000 for the purpose of sending out settlers to colonize a division of the Colony of the Cape of Good Hope. That your Petitioners, with their families, and near five thousand other British subjects, accepted the proposals made to them by His Majesty's Ministers, and early in the next year embarked for that Colony, ignorant of their actual destination, but relying on the faith and protection of the British Government. That on their arrival in Table Bay, they were informed that they were to be located on the Eastern frontiers, six hundred miles from the seat of Government, within the ancient boundaries of the Colony, but in a district which some of the Caffre tribes had encroached upon, and from whence they had the year before been expelled by the military. They therefore pray that your honourable House will take their unfortunate case into consideration, and order such measures to be taken as may be thought expedient for their future protection. This was supported the following year by a further petition, which was directed to be printed in the House of Commons Journal.41A motion to investigate the plight of the Albany settlers was subsequently defeated.42 No further mention was made of the issue in petitions to the House. Indeed, in the first nine years of the period under consideration only five petitions originated from South Africa. Art 5. Every male inhabitant of the full age of 21 years, who shall have occupied fixed property for his own use and benefit of the value of £25, for 12 calendar months next preceding the registration and time of voting within the limits of an electoral division shall be entitled to vote for members of Assembly to represent that division, and for members of Council. Art 6. Every male inhabitant entitled to vote for members of Assembly shall be eligible for election to a seat in the House of Assembly; and every male inhabitant of the age of 30 years who shall have resided in the colony during 3 years preceding the registration and time of voting, and who shall be the proprietor of landed property situate within the colony of the value of not less than £1000 shall be eligible for election to a seat in the Legislative Council. It gave an extensive list of reasons not to move and suggested that the issue be left for the future Cape parliament to decide. That your Petitioners have heard with deep regret of the Resolution passed by the Colonial Government in the House of Assembly, re. The annexation of the Transkeian territories to the Colony. All the Kaffir races of this country wish to be transferred from this Colonial Government to the Imperial Government, and they were sorry to hear that no retrocession of Transkeian territories was to take place. That your Petitioners now learn in fear that it is proposed to grant a constitution to the Transvaal and Orange River Colonies which embody opposite principles to those stated above and exposing all His Majesty's coloured subjects to the injury and degradation of being excluded for the sole reason of colour from any participation in any electoral franchise, local or general. The other four petitions were assessed to be of a similar nature and only the earliest received was printed as an annexure to the Select Committee report. However, three more were reproduced in the journal, The Aborigines' Friend.82They included the lengthy legal and historical exposition by Dr Abdullah Abdurahman, the Cape Town city councillor, and the shorter plea from John Tengo Jabavu, the editor of the newspaper Imvo, in their political organisational capacities, indicating that the range of writings sent to parliament was wider than the surviving official record might suggest. The series of petitions from South Africans to the House of Commons in London between 1833 and 1914 presents one minor strand in the web of communications and flow of information within the British Empire. The strand spans the time from the first petition in 1833 which was concerned with white colonists wishing to retain slavery, to the last from African political movements and churches condemning the new South African constitution. This strand in the imperial web is of importance in demonstrating the longevity and adaptability of inherited practices even when the powers nominally vested in London had in reality passed to delegated local authorities. The nature of the petitions themselves changed through the period in line with changes noted elsewhere as personal grievances in large measure gave way to political advocacy and protest. Both motives tended to emphasise the differences which opened between the interests and outlook of an emerging colonial society and those in the imperial metropole. Personal grievances focused upon the perceived shortcomings of the imperial governments, notably their lack of support, false promises, misguided policies and procrastination; issues common to the entire history of petitioning. Political advocacy in the form of protest and advice revolved around the development of new imperial policies, in order to influence the course of events rather than be passive bystanders. Only three issues excited a marked response from South African petitioners. The transportation crisis raised the issue of the future character of society in the country as a convict colony. The successful opposition to imperial policy, created a sense of solidarity in white society. The prompting of the introduction of representative government, in line with the North American and Australasian colonies, similarly departed from a centralised imperial administration and the emergence of self-governing states, controlled by the settler communities. However, the third major petitioning movement was backward looking concerned with the preservation of the status of the Church of England in the light of the disestablishment debates in Ireland and other colonies. A late development was the largely unsuccessful initiation of petitioning by the indigenous African population to draw attention to constitutional developments in the country which negatively impacted upon them, notably access to the local franchise. In this process loyalty to the imperial link, particularly the Crown, was stressed as a means of restraining the settler communities, which controlled the local legislatures, from further diminishing the legal status of the African and coloured population. The use of political petitioning followed the precedent demonstrated by the indigenous inhabitants of other colonial dependencies, notably India. In all cases petitions included substantial amounts of supporting information to advance the case presented. This was of value to the authorities in the tasks of adjudication and administration and remains as an insight into the concerns of the age raised by specific groups and individuals. The successful characteristics of political advocacy and protest included mass petitioning through either large numbers of signatures or large numbers of petitions. Neither option was open to South Africans as the population of the country was small and there were rarely more than a few petitions presented on any issue, enabling the House of Commons to ignore them, when confronted with more immediate problems. Petitioning the honourable House was though a link of final recourse, when all else had failed, symbolising the continued unity of the British Empire in an era when local political processes were evolving rapidly. Colonial political advancement essentially made the strand obsolete, as local legislatures assumed increasing control over their own affairs, and the imperial parliament became unwilling and ultimately unable to intervene. It is worth observing that the right to petition parliament was retained in local constitutions, based on the Westminster model, and has remained a vital element in the governmental process as a direct link between rulers and ruled. * The financial assistance of the National Research Foundation towards the costs of this research is hereby acknowledged. The opinions expressed in this article and the conclusions arrived at are not necessarily to be attributed to the National Research Foundation. 1 . L. Heerma van Voss, "Petitions in Social History: Introduction", International Review of Social History, 46, 9 (2001), pp 1-10. 2 . A. Würgler, '"Voices from among the 'silent masses': Humble Petitions and Social Conflicts in early Modern Central Europe", International Review of Social History, 46, 9 (2001), pp 11-34; B. Kumin and A. Würgler, "Petitions, Gravamina and the early Modern State: Local Influence on Central Legislation in England and Germany (Hesse)", Parliaments, Estates and Representation, 17 (1997), pp 36-60. 3 . M.S. Blaine, "The Power of Petitions: Women and the New Hampshire Provincial Governments, 1695-1770", International Review of Social History, 46, 9 (2001), pp 57-77; S. Zaeske, "Signatures of Citizenship: The Rhetoric of Women's Antislavery Petitions", Quarterly Journal of Speech, 88, 2 (2002), pp 147-168. 4 . R.A. Houston, Peasant Petitions: Social Relations and Economic Life on Landed Estates (Palgrave Macmillan, Basingstoke, 2014), pp 73-107; G. Kynoch, '"Your petitions are in mortal terror': The Violent World of Chinese Mineworkers in South Africa, 19041910", Journal of Southern African Studies, 31, 3 (2005), pp 531-546; K. Lunn and A. Day, "Deference and Defiance: The Changing Nature of Petitioning in British Naval Dockyards", International Review of Social History, 46, 9 (2001), pp 131-150. 5 . N. Corbett, "Parliamentary Petitions: An Untapped Library Resource", Australian Library Journal, 60, 3 (2011), pp 218-230; K. Ellingford, "The Purpose, Practice and Effects of Petitioning the Victorian Parliament", Australasian Parliamentary Review, 23, 2 (2008), pp 86-112; J.K. Johnson, '"Claims of equity and justice': Petitions and Petitioners in Upper Canada, 1815-1840", Histoire Sociale/Social History, 28, 55 (1995), pp 219-240; J.R. Robertson, Petitions of the early Inhabitants of Kentucky to the General Assembly of Virginia 1769 to 1792 (Genealogical Publishing, Baltimore: MD, 1998); J. Vernet, "Petitions from the Peripheries of Empire: Louisiana and Quebec", American Review of Canadian Studies, 38, 4 (2008), pp 495-512; D. Zaret, Origins of Democratic Culture: Printing, Petitions and the Public Sphere in Early-Modern England (Princeton University Press, Princeton: NJ, 2000), pp 231-240. 6 . S. Abraham, "Formal Writing, Questionnaires and Petitions: Colonial Governance and Law in early Colonial Malabar 1792-1810", Indian Historical Review, 40, 2 (2013), pp 285-305; K.O. Akurang-Parry, '"A smattering of education' and Petitions as Sources: A Study of African Slaveholders' Responses to Abolition in the Gold Coast Colony, 18741875", History in Africa, 37 (2000), pp 39-60; L. Kapteijns and J. Spaulding, "Women of the Zar and Middle-class Sensibilities in Colonial Aden, 1923-1932", Sudanic Africa, 5 (1994), pp 7-38; C.J. Korieh, '"May it please your Honor': Letters of Petition as Historical Evidence in a Colonial Context", History in Africa, 37 (2010), pp 83-106; P. Swarnalatha, "Revolt, Testimony, Petition: Artisanal Protests in Colonial Andhra", International Review of Social History, 46, 9 (2001), pp 107-129. 7 . A. Lester, Imperial Identities: Creating Identities in Nineteenth Century South Africa and Britain (Routledge, London, 2001), pp 176-192. 8 . C.V. Reed, Royal Tourists, Colonial Subjects and the Making of a British World, 18601911 (Manchester University Press, Manchester, 2016), pp 191-196. 9 . A. Thompson, "The Languages of Loyalism in South Africa c1870-1939", English History Review, 118, 477 (2003), pp 617-650. 10 . Union of South Africa, Debates of the House of Assembly, Volume 9, col. 3996, (Malan), 23 May 1927. 11 . A. Lester, "Imperial Circuits and Networks: Geographies of the British Empire", History Compass, 4, 1 (2006), pp 124-141. 12 . Z. Laidlaw, Colonial Connections, 1815-45: Patronage, the Information Revolution and Colonial Government (Manchester University Press, Manchester, 2005), pp 17-21; G.B. Magee and A.S. Thompson, Empire and Globalisation: Networks of People, Goods and Capital in the British World, c1850-1914 (Cambridge University Press, Cambridge, 2010). 13 . D. Hirst, "Making Contact: Petitions and the English Republic", Journal of British Studies, 45, 1 (2006), pp 26-50; R. Hough, "Do Legislative Petition Systems Enhance the Relationship between Parliament and Citizen?" Journal of Legislative Systems, 18, 3-4 (2012), pp 479-495; D. Judge, "Public Petitions and the House of Commons", Parliamentary Affairs, 31, 4 (1978), pp 391-405. 14 . P. Brand, "Petitions and Parliament in the Reign of Edward I", Parliamentary History, 23, 1 (2004), pp 14-38. 15 . G. Dodd, Justice and Grace: Private Petitioning and the English Parliament in the late Middle Ages (Oxford University Press, Oxford, 2007), pp 317-325. 16 . G. Pepin, "Petitions from Gascony: Testimonies of a Special Relationship", in W.M. Ormrod, G. Dodd and A Musson (eds), Medieval Petitions: Grace and Grievance (York Medieval Press, Woodbridge, 2007), pp 120-134. 17 . E. Wolf, "The Authorship of the 1774 Address to the King Restudied", William and Mary Quarterly, 22, 2 (1965), pp 189-224. 18 . D. Lambert, "The Counter-revolutionary Atlantic: White West Indian Petitions and the Proslavery Networks", Social and Cultural Geography, 6, 3 (2005), pp 405 -420. 19 . S. Drescher, "Public Opinion and Parliament in the Abolition of the British Slave Trade", Parliamentary History, 26, 1 (2007), pp 42-65; S. Drescher, Capitalism and Antislavery: British Mobilization in Comparative Perspective (Oxford University Press, Oxford, 1984), pp 92-93. 20 . R. Handley, "Public Order, Petitioning and Freedom of Assembly", Journal of Legal History, 2 (1986), pp 123-155, statistic at p140. 21 . Parliamentary Archives, Westminster, London (hereafter PA), HC/CL/JO/6/170 and 171 Session 1833, Reports of the Select Committee on Public Petitions 1833. 22 . P. Fraser, "Public Petitioning and Parliament before 1832", History, 46, 158 (1961), pp 195-211; J.E. Bradley, "Parliament, Print Culture and Petitioning in late Eighteenth Century England", Parliamentary History, 26, 1 (2007), pp 218-230. 23 . PA, Book/1248, B.J. Enright, Reports of the Committee on Public Petitions in the House of Commons Library, 1960. 24 . D. Nicholls, "Addressing God as Ruler: Prayer and Petition", British Journal of Sociology, 44, 1 (1993), pp 125-141. 25 . M. Jack, Erskine May's Treatise on the Law, Privileges, Proceedings and Usage of Parliament (LexisNexis, London, 2011), p 482. 26 . PA, HC/CL/JO/6, Record series includes the reports of the Select Committee on Public Petitions and the appendices for the period covered. The appendices were usually published in separate volumes. 27 . PA, HL/PO/6, Record series contains some original nineteenth-century petitions which for various reasons were not destroyed. 28 . P.A. Pickering, '"And Your Petitioners &c': Chartist Petitioning in Popular Politics, 1838-48", English Historical Review, 116, 466 (2001), pp 368-388, quotation at p 369. 29 . The Times, Our Parliamentary Correspondent, "Petitions to the House of Commons", 7 September 1901, p 4. 30 . C. Leys, "Petitioning in the 19th and 20th centuries", Political Studies, 3,1 (1955), pp 479-495. 31 . PA, HC/CL/JO/658, Session 1890, App. 30, p 15. The Indian Council's Amendment Bill attracted 748 petitions with 394 946 signatures in favour; 3 petitions with 45 896 signatures against; and 1 petition with 22 signatures for an amendment to be presented to parliament in the 1890 session. Such a scale of external petitioning of the imperial parliament was unique outside India. 32 . M. Siddiqi, The British Historical Context and Petitioning in Colonial India (Aakar Books, New Delhi, 2005), pp 17-37. 33 . Great Britain, Census of England and Wales 1911, General Report, Cd8491 (H.M.S.O., London, 1917), p 286. 34 . For example: PA, HC/CL/JO/6/197, Session 1839, App. 447, p 224. Petition from "merchants and others interested in the prosperity and civilization of Southern Africa", requesting foundation of Natal; and PA, HC/CL/JO/6/865, Session 1906, App. 17, p 17, Petition from "Alfred Mangena, a member of the Zulu race presently residing in England; and a law student of Lincoln's Inn for an Imperial Government enquiry into the Native Rising in Natal". 35 . PA, HC/CL/JO/6/218, Session 1842, App. 721, p 268. 36 . PA, HC/CL/JO/6/171, Session 1833, App. 1271, p 1369. 37 . PA, HC/CL/JO/6/497, Session 1875, App. 324, p 157. 38 . PA, HC/CL/JO/6/178, Session 1835, App. 1335, p 980. Original spelling retained. 39 . PA, HC/CL/JO/6/178, Session 1835, App. 1512, p 1131. 40 . PA. HC/CL/JO/6/187, Session 1837, App. 925, p 457. 41 . Journals of the House of Commons, Volume 93, Session 1837-8, p 615, 15 June 1838. 42 . Hansard, Series 3, Volume 44, Session 1837-8, cols 114-117. (Gladstone, Grey, division), 10 July 1838. The motion was rejected by 32 votes for and 41 against, in a House of Commons with 658 members, on the basis that the issues raised in had already been investigated. The low participation rate reflected the lateness of the vote, after midnight, towards the end of the daily order paper, to where most colonial matters were relegated. 43 . J.L. McCracken, The Cape Parliament, 1854-1910 (Clarendon Press, Oxford, 1967) pp 1-17. 44 . PA, HC/CL/JO/6/218, Session 1842, App. 721, p 368. 45 . PA, HC/CL/JO/6/264, Session 1847-8, App. 1052, p 552. Note that there was a three-month delay between the date of the document (10 March 1848) and its presentation to parliament (2 June 1848). 46 . PA, HC/CL/JO/6/287, Session 1851, App. 53, p 23. 47 . PA, HC/CL/JO/6/286, Session 1851, Petitions p 749. 48 . PA, HC/CL/JO/6/294, Session 1852, App. 7, p 6. 49 . PA, HC/CL/JO/6/303, Session 1852-3, App. 248, p 122. 50 . Cape of Good Hope, Votes and Proceedings of the House of Assembly, 1854-1910. The number of petitions received in Cape Town averaged approximately 100 per year until the early 1880s, thereafter the number rose to reach a peak of 623 in 1898, before declining to an annual average of 336 petitions between 1902 and 1909. 52 . PA, HC/CL/JO/6/272, Session 1849, App. 242, p 128. 53 . PA, HC/CL/JO/6/280, Session 1850, Apps 1 and 2, p 3. 54 . PA, HC/CL/JO/6/279, Session 1850, Report, p 3. 55 . PA, HC/CL/JO/6/279, Session 1850, Report, p 1602. 56 . PA, HC/CL/JO/6/280, Session 1850, App. 1406, p 652. 57 . PA, HC/CL/JO/6/287, Session 1851, App. 1356, p 655. 58 . PA, HC/CL/JO/6/310, Session 1854, App. 41, p 19. 59 . PA, HC/CL/JO/6/310, Session 1854, App. 961, p 426 (Cape Town) and App. 962, p 428 (Port Elizabeth). 60 . PA, HC/CL/JO/6/310, Session 1854, App. 1547, p 723. 61 . PA, HC/CL/JO/6/326, Session 1856, Report, p 964. 62 . PA, HC/CL/JO/6/393, Session 1863, App. 797, p 377. 63 . PA, HC/CL/JO/6/408, Session 1865, App. 582, p 274. 64 . PA, HC/CL/JO/6/426, Session 1867, App. 681, p 238. 65 . Hansard, Series 3, Volume 188, cols 5-15 (Manchester, Kimberley), 18 June 1867. 66 . PA, HC/CL/JO/6/401, Session 1864, App. 28, p 15. Original footnote: *sic. 67 . P.M.H. Bell, Disestablishment in Ireland and Wales (S.P.C.K., London, 1969), p 246; A.J. Christopher, "The Religious Question in the United Kingdom Census, 1801-2011", Journal of Ecclesiastical History, 65, 3 (2014), pp 601-619; J. Greenaway, Drink and British Politics since 1830: A Study in Policy Making (Palgrave Macmillan, Basingstoke, 2003) pp 29-52. 68 . E. Matthew, "Law and Religion in South Africa: An Anglican Perspective", Dutch Reformed Theological Journal, 54, 4 (2013), pp 64-73. 69 . PA, HC/CL/JO/6/426, Session 1867, App. 54, p 24. 70 . PA, HC/CL/JO/6/426, Session 1867, App. 243, p 109. 71 . PA, HC/CL/JO/6/426, Session 1867, App. 180, p 84. 72 . PA, HC/CL/JO/6/426, Session 1867, App. 289, p 119. 73 . PA, HC/CL/JO/6/434, Session 1867-8, App. 666, p 312. 74 . PA, HC/CL/JO/6/533, Session 1879, Report, p 789. 75 . PA, HC/CL/JO/6/534, Session 1879, App. 262, p 137. 76 . PA, HC/CL/JO/6/555, Session 1881, App. 403, p 189. 77 . L. Kuper, "African Nationalism in South Africa, 1910-1964", in M. Wilson and L.M. Thompson (eds), The Oxford History of South Africa, II, South Africa 1870-1966 (Clarendon Press, Oxford, 1971), pp 424-476. 78 . T. Karis and G.M. Carter (eds), From Protest to Challenge: A Documentary History of African Politics in South Africa, 1882-1964, Volume 1, Protest and Hope, 1882-1934 (Hoover Institution Press, Stanford: CA, 1972), pp 3-12. 79 . PA, HC/CL/JO/6/596, Session 1885, App. 5, p 3. 80 . PA, HC/CL/JO/6/797, Session 1901, App. 27, p 17-18. 81 . PA, HC/CL/JO/6/865, Session 1906, App. 52, p 35. 82 . "Petitions from South Africa", The Aborigines' Friend: Journal of the Aborigines' Protection Society, 7, 14 (August 1906), pp 606-615. 83 . PA, HC/CL/JO/6/878, Session 1907, App. 24, p 15. 84 . PA, HC/CL/JO/6/894, Session 1908, App. 51, p 33. 85 . Hansard, Series 4, Volume 192, c 1084, (Seely), 16 July 1908. 86 . PA, HC/CL/JO/6/912, Session 1909, App. 47, p 27. 87 . PA, HC/CL/JO/6/912, Session 1909, App. 48, p 27. 88 . PA, HC/CL/JO/6/912, Session 1909, App. 51, p 30. 89 . H. Hughes, First President: A Life of John Dube, Founding President of the ANC (Jacana, Johannesburg, 2011), pp 182-189. 90 . London School of Economics Library Archives, Special Collection, Pamphlets HD1(6)/D27. The Natives' Land Act of South Africa: An Appeal to the Members of the Imperial Parliament and Public of Great Britain (Edward Hughes, London, 1914). 91 . P. Limb, '"No people can be expected to be loyal under such difficulties': Ambiguities and Identities of the early African National Congress Leaders in South Africa", Social Dynamics, 29, 1 (2003), pp 1-26.